Pass coverage is essential in today’s game of football. Offensive coaches are finding innovative ways to spread the ball around the field. The key is to play sound pass coverage. What is pass coverage? Pass Coverage is being able to cover receivers in all areas of the field, while they attempt to get open and catch the football. The way we like to teach coverages here at vIQtory is by the number of “deep defenders”. If the coverage is cover 3, there are 3 deep defenders. Cover 2, two deep defenders and so on. 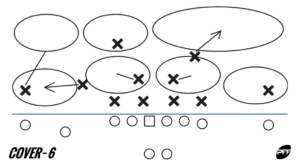 The cover 0 defense is often called behind a blitz (a 6 man pressure). Teams will rush 6 defenders and cover the 5 eligible receivers man to man. We often seen a heavy dose of press man coverage coupled with cover 0. Teams do this to muddle up the wide receivers and get to the quarterback as soon as possible. Cover 1 is similar to cover 0, although instead of bringing a blitz ( 6 man pressure), the defense will bring a dog (5 man pressure). Defenses can also double team wide receivers with cover 1, as they have an extra defender (when running a 4-man front). Cover 2 is the first zone coverage in our series of zone coverages. Whereas cover 1 has one deep defender with man coverage underneath, cover 2 has two deep defenders and all the underneath defenders are playing zone. Cover 2 is useful to defend against teams that like to throw crossing routes or short routes. It does however, put a tremendous amount of stress on the deep defenders. Ultimately the 2 deep defenders are responsible for splitting the field in half. Each defender must cover 26.6 yards each. That’s a lot! Cover 3 is the most balanced zone coverage as it has 3 deep defenders and 4 underneath defenders. The deep defenders are now splitting the field into thirds. Adding a third person to the mix now cuts the field to cover by 17.76 Yards for each deep defender to cover. Also known as an umbrella coverage, cover 4 has 4 deep defenders which are splitting the field into 13.325 yards. Cover 4’s weakness however, is the underneath coverage. Similar to how we broke down the cover 3 deep defenders, cover 4 relies on 3 underneath defenders to cover 17.76 yards each. 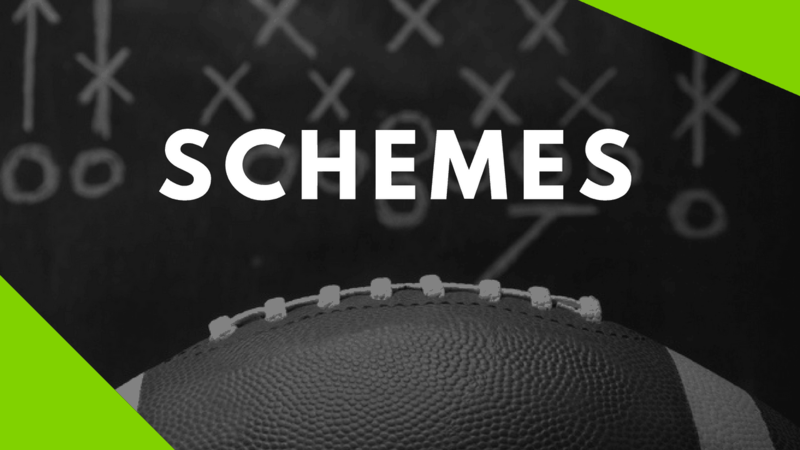 Coaches however, have gotten creative over the years with showing a cover 4, influencing flat routes and using the corners to rob underneath routes. We can see that it carries elements of both a Cover-4 and a Cover-2 scheme. On one side of the field we see the Cornerback dropping back to take 1/4 of the deep field with the safety on that side taking the next 1/4. This leaves the other safety left the responsibility of handling the other 1/2 of the deep field. It is reasonable to expect that the cornerback who drops deep is doing so on the same side which their is a nickel, or slot, corner. This is because this defensive back is more adept at covering the boundary zone than a linebacker is. With one cornerback dropping deep downfield to take a 1/4, the underneath coverage has to rotate to fill this gap. Since we now know the corner that rolls deep is typically on the same side as the nickel corner, we assume that the nickel corner will move to the boundary. The remaining linebacker core and other cornerback essentially drop into zone where they are. As shown in the image above, this results in about each player owning 1/4 of the underneath field. The responsibilities underneath look very similar to a Cover-3 defense. The strengths and weaknesses come from who is on the field at the time this defense is called. A nickel package vs. a 4-3 (or even a dime package) will dictate the speed and coverage skills on the players on the field. An offense could look to exploit a linebacker (as oppose to a corner) dropping all the way to the boundary. On the flip side, the offense may look to run the ball toward the nickel corner side if they favor that matchup over going toward a linebacker instead. A zone defense is prone to a play-action play. If either safety, or the corner with deep 1/4 responsibility bites on a fake, it can leave a huge opening for the offense to exploit. Like any defense, the Cover 6 should be used as part of a mix of looks to confuse an offense and not necessarily used as the base scheme. According to Pro Football Focus, the Chicago Bears ran this significantly more than any other team in the NFL, with their usage topping the Rams in second place. Note that these teams only used this scheme in under 20% of their snaps. How do you run your cover 2,3,4 and 6 defenses? Are there any coaching points we missed that you’d like to explain in your own coaching way? Do you still have questions about the Cover 6 defense? Or is there another topic you want us to breakdown? Let us know in the comments below! Read more football content at our blog.